Error 0x8007003B: An unexpected network error ocured. 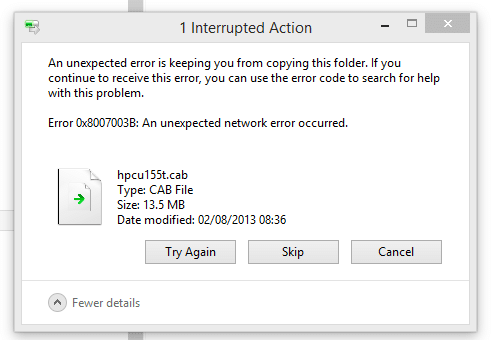 You may also notice that the same error does not occur when using Windows 7 and prior along with OSX. In this particular scenario it made no difference whether the inbuilt Windows VPN client was connecting via PPTP, L2TP or Open VPN. The windows client was connecting to a Synology Diskstation using the inbuilt VPN Server. The problem was also not rectified when connecting the client VPN to the inbuilt VPN server on the router as well. It was determined that SMB3 or higher was having issues connecting over a slow VPN using ADSL2. The same setup at a different site was able to produce the same results. Restrict the particular Windows workstation to use only SMB1 until a permanent solution was available. Microsoft do not recommend disabling SMB2 and SMB3 other than for troubleshooting however because this was a remote workstation it was the only solution that would work at this stage. To disable SMBv2 and SMBv3 enter the following commands in to an elevated command prompt and restart the computer. Great post, it help me to resolv a problem with copy files from worstation windows 10 with VPN PPTP. Thanks, very simple and great.